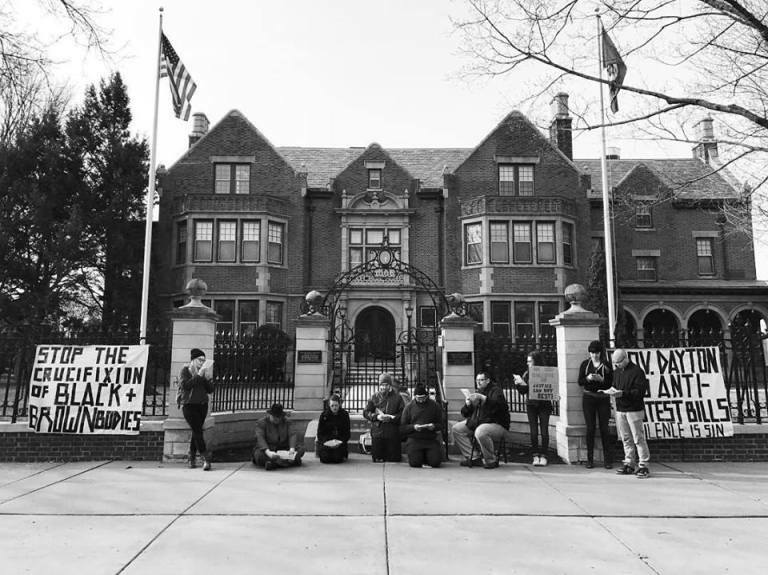 On Good Friday 2017, folks from CPI, the Minneapolis Catholic Worker, and some friends were arrested at the Governor’s Mansion demanding that Governor Mark Dayton veto HF 896, also called the anti-protesting bill. The proposed bill would have criminalized protests, drastically increased fines and promoted harsher sentencing. The authors of the anti-protesting bill particularly targeted activists of color and groups like Black Lives Matter Minneapolis, who have organized non-violent protests in the wake of the police killings of unarmed black people. We carried a large cross, conveying their belief that the anti-protest bill would fuel the crucifying police violence experienced disproportionately by black and brown Americans. We believe that Jesus was killed for standing up against the social and economic oppression of his community within a militarized Roman empire. Much of his ministry was in protest against violence and injustice, the same protest criminalized under the proposed bill. Governor Mark Dayton saw the entire action through the window. After a great deal of public pressure, the bill was vetoed.